The letter cites a AQMD study that finds the transportation sector accounts for up to 85% of criteria and ozone precursor emissions in the South Coast Basin. And the letter cites a report by the University of California and the Institute for Transportation and Development Policy, which found a significant shift to public transit and active transportation coupled with a decrease in road construction, parking garages and other things that encourage car ownership results in a 40% reduction in GHG emissions. Fund deployment of zero- and near-zero-emissions freight technologies. Target funding for, prioritize multi-benefit projects in, and avoid burdening “disadvantaged communities” already disproportionately burdened by multiple sources of pollution. The letter points out that low-income communities and communities of color are already exposed to the highest rates of transportation-generated pollution and consequently suffer from higher rates of asthma, COPD (chronic obstructive pulmonary disease), obesity and other chronic illnesses. What Is the Future of L.A.’s Transit? What does Phillip Washington, the new CEO of the Los Angeles County Metropolitan Transportation Authority (Metro), think is the future of transportation in his new home in L.A. County? Washington comes to Los Angeles after six years heading Denver’s Regional Transportation District in a period of rapid growth, particularly for rail. In the midst of the recession, he secured $1 billion in federal grants and completed planned rail expansion on time and under budget. Washington, who grew up on the south side of Chicago, is also a veteran of the U.S. Army, where he served for 24 years and earned the highest non-commissioned officer rank an enlisted person can achieve. In Los Angeles County, Washington will be presiding over major projects that include five new rail lines, the widening of the 5 freeway, and massive bike lane expansion. What does Washington think L.A.’s transit priorities should be, and what is his vision for the region? How does he see Angelenos getting around five, 10, and 25 years from now? Washington visits Zócalo to talk about how his experiences in Denver and the military have prepared him to run Metro, where L.A. fits into America’s larger transit landscape, and the politics of urban transportation today. Alhambra Vice Mayor Barbara Messina’s letter (Aug. 2) is right about one thing: The city should not be accused of being “imploded by humans.” Rather, it is being imploded by over-development and the increased traffic congestion and pollution resulting from that over-development. Messina claims that Alhambra has been overrun by cut-through traffic. The truth is that Alhambra suffers no more cut-through traffic than any of the neighboring cities. Traffic studies by independent transportation planners have consistently shown that 87 percent of that traffic is local. When Alhambra residents learn that the proposed tunnel will have no entrances or exits for its entire 4.5-mile length; that it will not be a freeway because tolls will be charged; that it will be virtually impossible to rescue people when there is a fire in the tunnel, they are overwhelmingly opposed. The proponents of the tunnel have not been able to prove that it is fiscally sound. Let’s use our resources more responsibly to build a mass-transit system that will provide commuters with viable options. That will reduce traffic congestion on local streets as well as on all of the region’s freeways. It is a good thing Barbara Messina isn’t bothered by the facts or she would have to change her views. The Draft Environmental Impact Report notes that only half of the 13 percent of cut-through drivers would use the tunnel if it was built. The tunnel would take very little of the traffic off Alhambra streets. The DEIR notes that some intersections would see an increase in delays and traffic. Contrary to her assertion that South Pasadena and Pasadena are rich cities, half of the people in South Pasadena are renters. These are not wealthy folks. Pasadena is also a city with a variety of neighborhoods, some wealthy and some not so wealthy. Alhambra city government is wealthy from the taxes it earns from the many multi-family dwellings and the many businesses in town. It can spend millions and millions promoting the tunnel. The tunnel is not a solution to what ails transportation in Southern California. Council weighs dropping out of regional group, citing its 710 stance. According to Barbara Messina, La Canada has "no horse in the race at all." Just proves she hasn't read the DEIR or examined the 2035 traffic predictions after a tunnel (single or dual) is built. By Metro, Caltrans and CH2MHill's own admissions, La Canada would be hammered by traffic! La Cañada City Council members questioned Tuesday the value of continuing the city’s membership in the San Gabriel Valley Council of Governments in the wake of that group’s public support of a 710 Freeway tunnel, which the city opposes. La Cañada Flintridge has been a member of the Council of Governments — a joint powers authority that assembles 31 cities and six area districts to plan and coordinate regional transportation issues — for the past 18 years and has benefited from several grants and programs to which members are entitled. 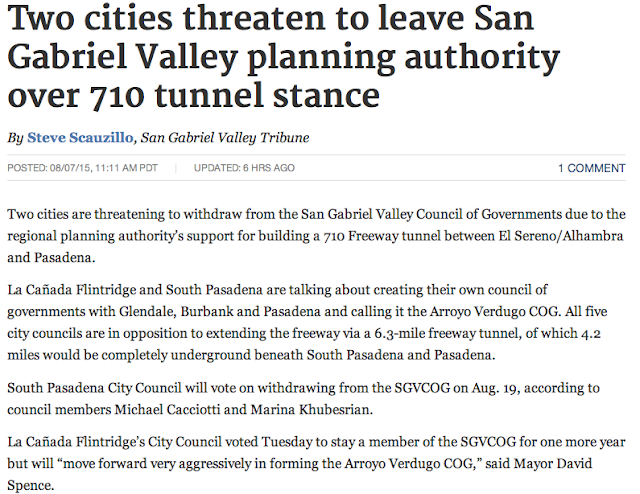 But in June, the SGV-COG voted 17-6 to publicly support plans for a 4.5-mile underground tunnel connecting the 710 Freeway’s end points, despite requests from La Cañada, Pasadena, South Pasadena and Sierra Madre that it refrain from weighing in on the matter. The discussion on the table Tuesday was whether La Cañada should pay its annual $11,571 in membership dues for Fiscal Year 2015-16, or withdraw its membership altogether. Alexander also posed the question of whether the council would be interested in instead seeking membership in the nearby San Fernando COG. Another option would be formalizing an existing relationship with the cities of Glendale, Burbank, Pasadena and South Pasadena, which already convene as the Arroyo Verdugo Subregion, into a new joint powers authority and possibly establishing an Arroyo Verdugo COG. On the other hand, leaving San Gabriel group now would create for La Cañada an opportunity cost, as the city would no longer be eligible for supplemental benefits provided to its COG members, Alexander told the council. Councilwoman Terry Walker, who currently represents the city in the San Gabriel Valley COG, supported the idea of the city discontinuing its membership in the regional group. Although Walker’s fellow council members shared their dissatisfaction with the regional body’s support of a 710 Freeway tunnel and the apparent lack of voice smaller member cities seem to have, they expressed they were loath to lose the benefits of membership and their voice in a regional forum. Ultimately, the council voted 4-1 to pay the city’s 2015-16 membership dues to the COG, instructing Alexander to actively pursue with officials in Glendale, Burbank, Pasadena and South Pasadena the formation of a new joint powers authority. “I think it’s better to be on the inside, in case some other issue comes up, than to be on the outside,” said Mayor Dave Spence, who formerly represented the city on the Council of Governments and was its president for two years. “I would agree to a 4 to 1 vote only if our city manager goes full steam ahead and makes an extremely aggressive effort to try to form the Arroyo Verdugo COG,” Spence added. Asked Wednesday about whether it was appropriate for the SGV-COG to show its support for a 710 tunnel when some of its member cities were opposed to the project, Alhambra Vice Mayor Barbara Messina, a pro-tunnel advocate who represents her city on the panel, said solving congestion issues related to the freeway has always been a priority for the group. “The 710 gap completion has been part of the COG’s main projects, which they’ve always been supportive of. It’s not just a San Gabriel Valley issue, it’s a regional issue,” said Messina, claiming that an underground tunnel wouldn’t negatively impact most of the antitunnel cities, especially La Cañada. “They have, as far as I’m concerned, no horse in this race at all,” Messina added. Should Sierra Madre Join the Move to Dump the SGVCOG? There is an interesting article up on the Pasadena Star News news site today about a move by some area cities to abandon the San Gabriel Valley Council Of Governments and start a "COG" of their very own. An overdue move in the minds of some. These cities would then create something they're calling the Arroyo Verdugo COG, an organization that would hopefully be far more responsive to the needs of cities located in the western portion of the San Gabriel Valley. 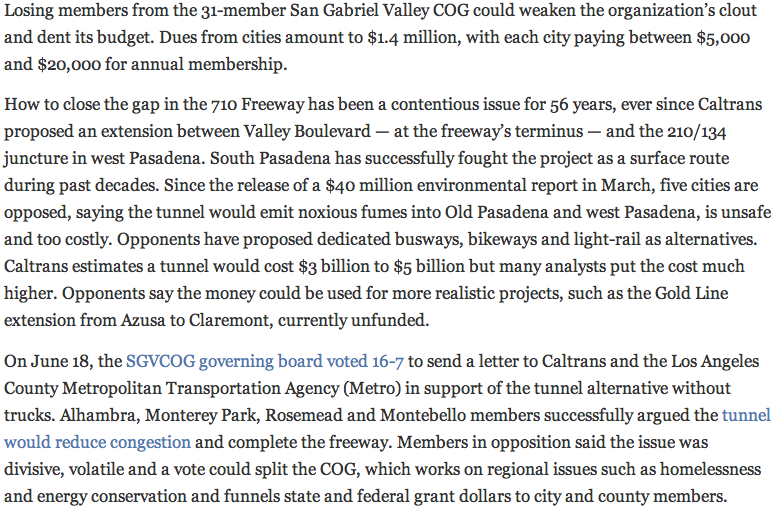 The issue driving this breakaway move being the SGVCOG's senseless and, in my opinion, less than aboveboard support for the 710 Tunnel. Something that, if built, would have devastating environmental consequences for any of the cities located along the 210 Freeway. Including those who support building it. Charges of unscrupulousness, of course, being no stranger to the SGVCOG (link). 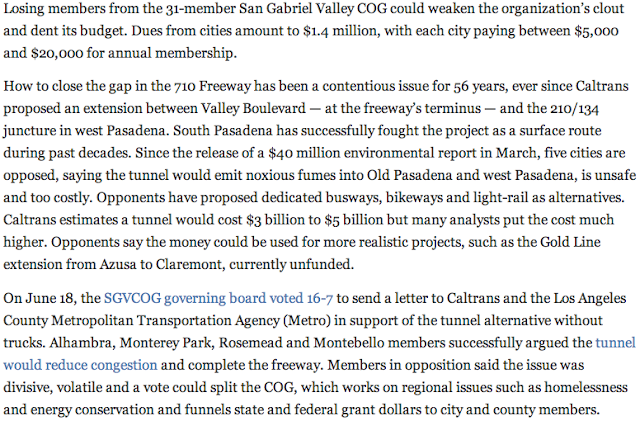 Sierra Madre, which ponied up $50,000 in taxpayer dough a while back to join with several other cities in the fight to stop this tunnel (link), has yet to consider making such a move. Which kind of leaves the city in the unfortunate and somewhat schizophrenic position of having both paid money to fight this unhappy project, while at the same time also giving money to support the SGVCOG, an organization that has now made building the 710 Tunnel one of its very top priorities. Hopefully the Sierra Madre City Council will give this disconnect a long hard look once they return from their long August break. The rest of this article can be found here. A huge “thank you” to everyone who submitted a comment letter on the SR 710 Draft EIR/EIS. No matter your level of expertise or how long your letter was, your voice will be heard. If you submitted a comment letter to the SR 710 DEIR/EIS, the No 710 Action Committee would appreciate a copy for its archives. You can email your comment to jan@soohoos.org. Thank you! Now that the SR710 Draft EIR/EIS comment period has expired, it’s time we turn our attention back to adding signatures to the No 710 Action Committee petition. We have 3,347 signatures and that is terrific, but it is still about 1600 signatures shy of our goal of 5,000. There are over 1,000 people on our email list who have received this message. We challenge each and every one of you to secure at least one additional person to sign the petition. If everyone lives up to the challenge, we will really boost our numbers and hopefully exceed the 5,000 mark. It’s not that difficult – talk to a neighbor, a family member, a friend or co-worker. It only takes a moment, but the impact could last a lifetime if we can stop this tunnel from being built. So, come on everyone. Together, we can make this happen! Do it today! Click on the Yellow button "Sign the Petition"
About 30 people attended a meeting at the El Sereno Senior Center last week to discuss alternatives for closing the “transportation gap” between the end of the 1-710 Freeway in El Sereno near the Alhambra border and the northbound 210 Freeway in Pasadena. It was the second such meeting in the neighborhood since Metro released its Draft Impact Report/Environmental Impact Statement (DIR/EIS) for the controversial transportation project in March, and the final meeting before the comment period on the report ended yesterday, Aug. 5. El Sereno residents do not feel they have been given enough information “to know what the problem is or what the solution is,” said the meeting moderator, Kevin Ocubillo, planning deputy for Councilman Jose Huizar. They have not yet had an open conversation with Metro or Caltrans, he said. The SR-710 project has been on the books for nearly 60 years but languished for decades when residents living along the path — including in El Sereno — strongly objected and won court injunctions against what was then to be a surface freeway. During the 1960s, Caltrans purchased 500 houses along the then proposed freeway expansion route; nearly half, 220, were in El Sereno. The properties are still owned by Caltrans, which plans to sell the properties since the surface freeway has been eliminated from consideration. Residents of El Sereno voiced their concerns about feeling excluded in the SR 710 meetings during a community meeting last week. Instead, the five alternatives for improving traffic in the region in the current Draft EIR/EIS now include: a bored freeway tunnel; light rail train; rapid bus lines; a traffic management system and the required “no build” option. The proposed alternatives, however, have done little to lessen heated views on the project. 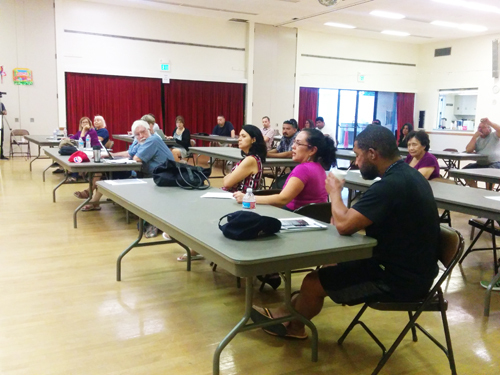 Last week’s meeting in El Sereno was co-hosted by the El Sereno Organizing Committee (ESOC), Natural Resources Defense Council (NRDC) and the Office of Councilman Huizar, who represents the area. The councilman felt it was important to hear directly from El Sereno residents about their concerns, said Huizar Spokesman Rick Coca. “For the past 56 years, Pasadena and South Pasadena want to dictate how El Sereno should live,” Fuentes said. During the meeting, people complained that Caltrans and Metro have done a poor job of listening to El Sereno residents. It doesn’t seem to matter to the transportation agencies if eastside residents provide input, ESOC President Hugo Garcia said. From the beginning, “[Metro/Caltrans] made their choices and we weren’t taken into consideration,” he said. Just 4.7-square-miles in size, El Sereno is home to about 44,000 people, the vast majority Latino and working class. The Los Angeles neighborhood is right where the 710 Freeway now ends, forcing thousands of vehicles onto local streets. The Draft EIR does not really mitigate the traffic issues in El Sereno, Garcia told EGP. Instead, it causes more traffic, environmental, health and safety issues for local businesses and residents, he said. “If a tunnel is built, there will be a lot of danger,” Garcia said. “What if there is a fire? Innocent people could pay the consequences,” he warned. He wants Metro and Caltrans to go back to the drawing board and develop a better multimodal traffic diffusion plan to synchronize traffic signals and implement traffic calming measures. “Prior to release of the Draft EIR/EIS, Metro and Caltrans conducted 92 community meetings, participated in six city-sponsored community forums and held over 200 briefings with community stakeholders,” Metro spokesperson Paul Gonzales said, defending the agency’s outreach. “Any story indicating Caltrans and Metro have not provided opportunity for comment while the comment period [was] still open is based on opinion and not fact,” he said, pointing out that five public hearings were held on the Eastside, including one at the Christian Presbyterian Church in El Sereno on May 7. State law only requires that we allow a 45-day period to comment on the Draft EIR/EIS, but we extended the period to 120 days, Gonzales told EGP. Huizar, however, was not happy with Metro/Caltrans’s outreach and decided to join with community groups to host meetings focused entirely on the needs of El Sereno and the surrounding communities, Coca said. According to Coca, the comment letter submitted by Huizar yesterday included the feedback he received from residents, as well as his longtime opposition to the tunnel option and the failed logic of the other proposed routes. Huizar believes there isn’t any consensus at this point because no truly viable, vetted and well thought out proposal has been offered to the residents of El Sereno, he said. “People do think, and we agree, that if we focus on local alternatives that improve traffic and access using a combination of street improvements and increased public transportation, that would be a much-more cost-effective answer to traffic issues than building a $5.6 billion outdated and bloated freeway tunnel model that will likely be a toll road,” Coca said. Metro/Caltrans will now gather all the comments submitted since March—either at public hearings, by email and mail—to create a final report on the recommendation of the agencies’ final alternative. 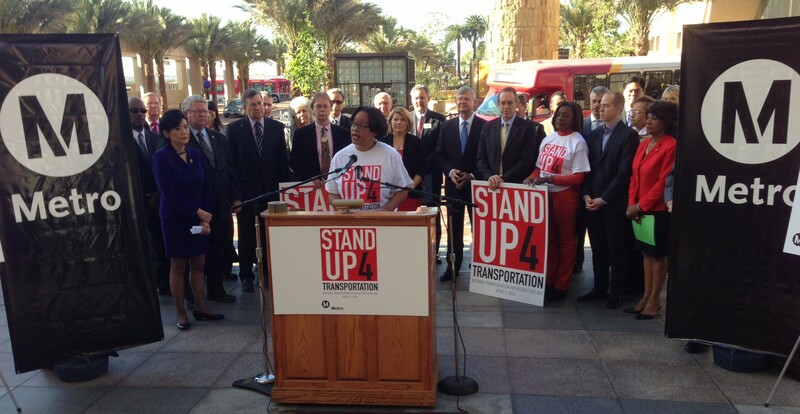 Then-Metro Interim CEO Stephanie Wiggins speaks at a StandUp4Transportation rally last April. CEO Phil Washington appointed Wiggins as Deputy CEO. In a July 23 memo [PDF] to Metro staff, new CEO Phil Washington outlined his initial foray into Metro restructuring, including leadership changes at many key posts. In May, Washington left his post as head of Denver RTD to lead Metro. Washington now brings former Denver colleagues to staff three high-level Metro leadership positions. Stephanie Wiggins is now Deputy Chief Executive Officer (DCEO.) 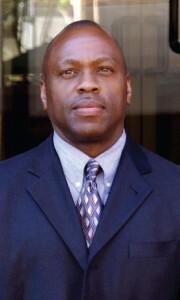 Wiggins was the interim CEO serving after Art Leahy’s departure until Phil Washington’s arrival. Wiggins has been at Metro for seven years, and was Metro’s lead on implementing its ExpressLanes program. Rick Clarke (Richard F. Clarke) takes over as Executive Director of Engineering and Construction, which Washington is renaming “Program Management.” Since 2010, Clarke worked under Washington as Assistant General Manager of Capital Programs at the Denver RTD. Elba Higueros is Metro’s new Chief Policy Officer. Higueros has been at Metro since 2003, and was a Transportation Planning Manager working in Congestion Reduction for the past 3 years primarily on the ExpressLanes program. Alex Wiggins is Metro’s new Executive Director of Security. Wiggins was Vice President of Security Services for Transit Safety and Security Solutions where he was responsible for security on Denver RTD’s successful public-private partnership (P3) Gold Line light rail project. Pauletta Tonilas is Metro’s new Chief Communications Officer. Tonilas also comes from Denver RTD where she serves as Senior Manager of Public Relations and Public Information. She is credited with shepherding Denver’s passage of a transportation sales tax measure to fund Denver RTD’s FasTracks rail expansion. Washington created a new of Office of Extraordinary Innovation. While that sounds like hoverboards, it actually starts with a new strategic plan and a focus on public-private partnerships. The new Innovation Office is highlighted in this article at The Source. There are a few other miscellaneous internal changes mentioned in the memo. Asset Management (responsible for the agency’s much referenced bus and rail system’s “state of good repair”) moves from the Operations Department to Risk and Safety Management Department. Metro will also increase annual safety training for operators. As far as SBLA can discern, Metro staffers formerly in these positions, including Bryan Pennington and Ann Kerman, remain at the agency. Deputy Executive Officer for Communications Ann Kerman resumes her actual deputy status, though she was effectively acting head since Noelia Rodriguez’ departure. The outline of Washington’s restructuring was initially summarized via Twitter by Laura Nelson of the L.A. Times. WPRA Finds Caltrans' SR-710 Draft EIR to be "Grossly Inadequate"
The California Department of Transportation’s SR-710 North Study Draft Environmental Impact Report (DEIR) misrepresents data in favor of the tunnel alternative and fails to address substantial environmental and community impacts, a Pasadena residents group said Friday. 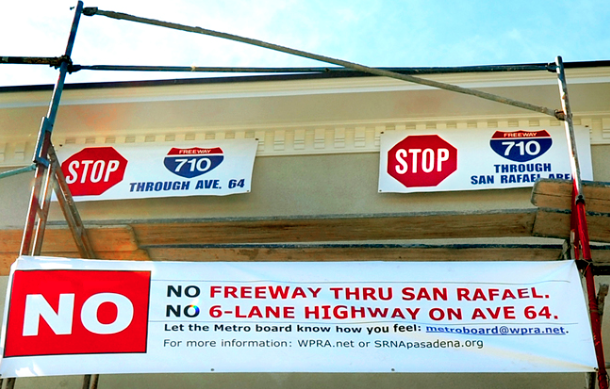 These and other findings were delivered to Caltrans this week as part of the West Pasadena Residents’ Association’s formal comments on the DEIR. The comments have also been published online at www.wpra.net. 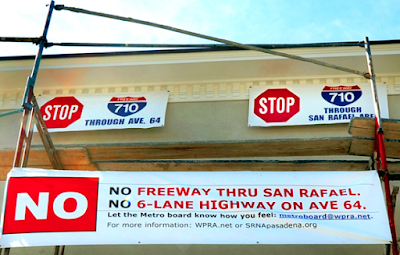 “After careful analysis, it is clear that the SR710 DEIR is report is grossly inadequate and should not be adopted,” said Geoffrey Baum, president of the West Pasadena Residents’ Association (WPRA). WPRA said it assembled a team of experts who worked for the better part of a year to address and comment on Caltrans’ massive, 50,000+ page environmental impact document. More than two dozen expert scientists, environmentalists, attorneys, university professors, engineers, planners, policy experts, legal experts, transportation experts, CEQA/NEPA experts, and historic preservation activists from USC, JPL, and other institutions helped draft the WPRA’S 430+ page comment document, the group said. These experts found inadequacies in almost all of the DEIR’s sections, including growth, tunnel boring machine failure, land use, community impacts, traffic, transportation, air quality, noise, hydrology, water quality, geology, energy, and more. The team found that, from its inception, the SR-710 Study environmental process has been improperly conducted in a manner to justify and sustain a decision already made: the freeway tunnel as the preferred alternative. Caltrans and Metro’s bias in favor of the tunnel continues in the DEIR with “the selection of the Study Area boundaries and alternatives, the bundling of options, the deferral or complete failure to address large environmental impacts for the tunnel alternative, data averaging, and the selective presentation and manipulation of data,” Baum and WPRA vice president and 710 Team lead Sarah Gavit wrote in a letter to Caltrans. The SR-710 Analysis of the Alternatives is also grossly deficient, the group said. For example, the SR-710 Study fails to consider a multimodal alternative, despite numerous community inputs to do so during the scoping process. This is egregious particularly in light of the 1999 injunction prohibiting a 710 surface freeway extension due to Caltrans’ failure to consider a multimodal low build alternative. Remnants of historic 710 extension aspirations, these transportation and safety nightmares have divided and plagued these communities for more than a half century. Moreover, the Draft EIR/EIS proposes several tunnel alternative options that are not credible. This includes the ‘no truck’ option, which is not enforceable either in the near term or future, and the single-bore tunnel option, which is not reasonable because it exceeds margins of safety and passes unacceptable fire and accident risks onto tunnel users. WPRA expects Caltrans to respond in full to these and other comments before issuing a Final Environmental Impact Report. Founded in 1962, the West Pasadena Residents’ Association (WPRA) is an all-volunteer organization dedicated to maintaining and enhancing the character of southwest Pasadena and the quality of life throughout Pasadena. 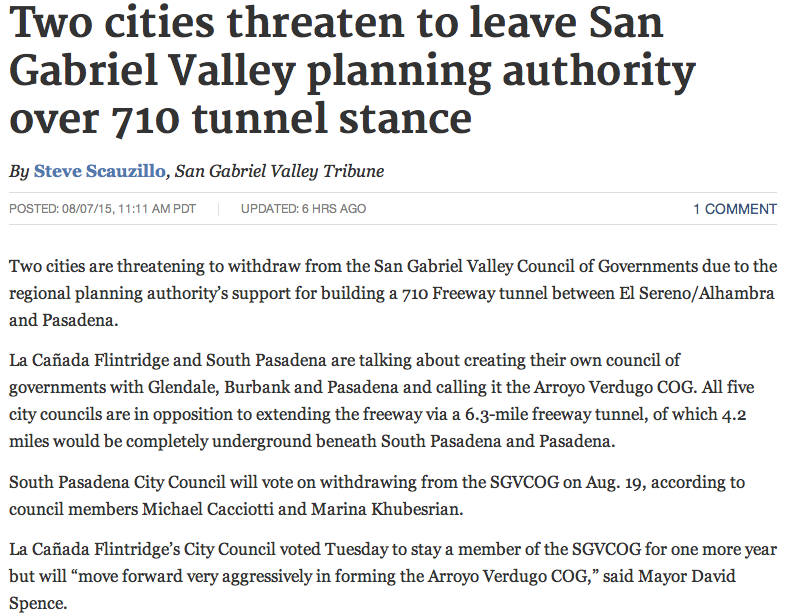 Two cities are threatening to withdraw from the San Gabriel Valley Council of Governments due to the regional planning authority’s support for building a 710 Freeway tunnel between El Sereno/Alhambra and Pasadena. La Cañada Flintridge and South Pasadena are talking about creating their own council of governments with Glendale, Burbank and Pasadena and calling it the Arroyo Verdugo COG. All five city councils are in opposition to extending the freeway via a 6.3-mile freeway tunnel, of which 4.2 miles would be completely underground beneath South Pasadena and Pasadena. South Pasadena City Council will vote on withdrawing from the SGVCOG on Aug. 19, according to council members Michael Cacciotti and Marina Khubesrian. La Cañada Flintridge’s City Council voted Tuesday to stay a member of the SGVCOG for one more year but will “move forward very aggressively in forming the Arroyo Verdugo COG,” said Mayor David Spence. Losing members from the 31-member San Gabriel Valley COG could weaken the organization’s clout and dent its budget. Dues from cities amount to $1.4 million, with each city paying between $5,000 and $20,000 for annual membership. How to close the gap in the 710 Freeway has been a contentious issue for 56 years, ever since Caltrans proposed an extension between Valley Boulevard — at the freeway’s terminus — and the 210/134 juncture in west Pasadena. South Pasadena has successfully fought the project as a surface route during past decades. Since the release of a $40 million environmental report in March, five cities are opposed, saying the tunnel would emit noxious fumes into Old Pasadena and west Pasadena, is unsafe and too costly. Opponents have proposed dedicated busways, bikeways and light-rail as alternatives. Caltrans estimates a tunnel would cost $3 billion to $5 billion but many analysts put the cost much higher. Opponents say the money could be used for more realistic projects, such as the Gold Line extension from Azusa to Claremont, currently unfunded. On June 18, the SGVCOG governing board voted 16-7 to send a letter to Caltrans and the Los Angeles County Metropolitan Transportation Agency (Metro) in support of the tunnel alternative without trucks. Alhambra, Monterey Park, Rosemead and Montebello members successfully argued the tunnel would reduce congestion and complete the freeway. Members in opposition said the issue was divisive, volatile and a vote could split the COG, which works on regional issues such as homelessness and energy conservation and funnels state and federal grant dollars to city and county members. Some say the June vote is coming back to haunt the COG. La Cañada Flintridge Councilwoman Terry Walker wanted her city to quit COG immediately. Instead, the council voted to pay its $11,571 dues for 2015-16 on the condition its staff works on forming a new COG. City Manager Mark Alexander said he’s spoken to leaders from Pasadena, Glendale and Burbank and they are interested. Pasadena has paid its dues for next year and is not presently considering withdrawal, said Mayor Terry Tornek. However, he said the SGVCOG does not benefit Pasadena and he’s very interested in a possible new COG with the Arroyo Verdugo cities. Pasadena, La Cañada Flintridge and South Pasadena say the SGVCOG does not listen to their viewpoints. “I’ve seen the disrespect they have for us,” Spence said. However, the foothill city did not want to forfeit participation in grant monies collected by the SGVCOG, including money for freeway sound walls, at least for the next year. Khubesrian said her pleas to take a neutral position fell on deaf ears. She called the SGVCOG’s stand on the 710 project “very premature and poorly thought through” and added: “Our voice is not being heard.” Tornek, Pasadena’s representative, called the vote “very offensive, inappropriate and foolish” and said he and others warned the board about repercussions, including cracks in the SGVCOG’s unity. Fran Delach, interim executive director, said leaving the SGVCOG over one issue ignores the many positive benefits of membership. For example, the SGVCOG recently acquired $30.2 million in funding for smaller transportation projects from Metro that will be doled out to member cities. Barbara Messina, an Alhamba council member and SGVCOG past president, said forming a new COG will not be easy. “If they think they can start a COG they’ll have a rude awakening,” she said.